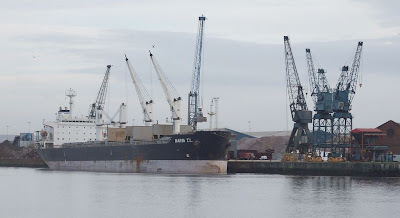 Pictured at Shieldhall Riverside berth, the self-geared bulk carrier MARIA T L is discharging a cargo of animal feed. This attractive looking vessel was built in 1997 as PRETTY RUBY, by STX Shipbuilding in Korea. She is 47,075 tonnes deadweight, and 190 metres long. Flying the Greek flag now, she is owned by Finamadre Maritime, and managed by Tri-Marine Shipping. She sailed this evening for Southampton.